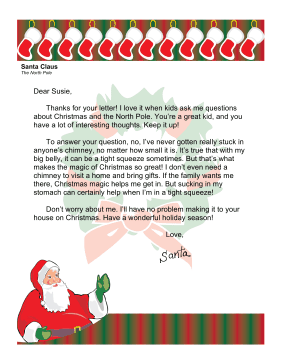 Santa assures a child that he will not get stuck in chimneys in this decorated letter. Thanks for your letter! I love it when kids ask me questions about Christmas and the North Pole. You're a great kid, and you have a lot of interesting thoughts. Keep it up! To answer your question, no, I've never gotten really stuck in anyone's chimney, no matter how small it is. It's true that with my big belly, it can be a tight squeeze sometimes. But that's what makes the magic of Christmas so great! I don't even need a chimney to visit a home and bring gifts. If the family wants me there, Christmas magic helps me get in. But sucking in my stomach can certainly help when I'm in a tight squeeze! Don't worry about me. I'll have no problem making it to your house on Christmas. Have a wonderful holiday season!